is the big brother of [qseq]?. it's based on the same idea, but more powerfull. it is a loop-based sequencer and rather thought to be used in live situations, where you would like to have fast influence and easy access to what is played currently, than to create complex arrangements or complete songs. you don't want to program beethovens 9th with qseq2. as in pd you start with an empty space. first you have to create a pattern to work in (click the green button). this new pattern is empty also. you can make it visible by clicking the vis button. now you need to create sequences (grains) in this pattern. if you opened drum-delta, oxygen or another synth, that is compatible with qseq2, you can choose the instrument, the next sequence is for, with the instrument-selector (the bigger of the two horizontally challenged sliders). with this slider you can browse through all instruments, that are opened and compatible with qseq2. if no such instrument is open, the only option showed is no_instr. choose an instrument and the length (in 16th) of the next grain, you want to create. the default is 16, as you know it from common step-sequencers. if you now create the grain by clicking the button, a toggle with the name of the instrument and a row with the appropriate number of toggles will appear in the pattern-window. to let the instrument play, just enable or disable the toggles in the row (master must run). 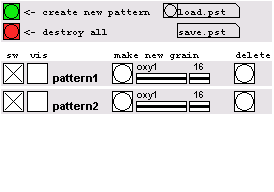 you can create as many grains as you want to in the pattern. you can mute or activate every grain seperately by clicking the toggles on the left side. the length of a grain is also its loop-length. this means, you can create interesting rhythmic patterns with odd lengths (7, 13...). to delete all grains in a pattern, click the appropriate delete button in the main window. as with the grains, you can create as many patterns in the main-window as you like to. also you can mute every pattern separately with the sw toggle. create different fragments of the song in different patterns. so you are able to mute or play each songpart with one click. i think, it's not necessary to explain what the destroy all button is for. qseq2 does not have a clock itself. it uses the clock of master. you must have openend master in order to play a song with qseq2. using qseq2 sometimes leads to pd-crashes, especially in the case, when you load a new preset or qseq2 gets a dump request (both clear and rebuild the whole gui). before a new user is joining a running session, i recommend to save the actual preset, close qseq2, and, after the new user openend creator, to open qseq2 again and load the preset. i assume this is not a bug of qseq2 itself, but a problem of pd with dynamically created guis. it seems, that is problem is better with pd-0.39. i want to add an option to choose between creating classic grains, that are rows of toggles and send bang-messages, and a new kind of grains, that are rows of numberboxes and send float-messages. a short howto about making your own netpd-instrument compatible with qseq2.